We appreciate your feedback about your support experience with SkyVerge, developers of WooCommerce Customer / Order CSV Export. This helps us maintain high standards on the WooMarketplace, and helps SkyVerge improve. We’ve simplified the data transfer from WooCommerce to CRMs or other systems by providing a customer / order exporter that outputs CSV formatted files. 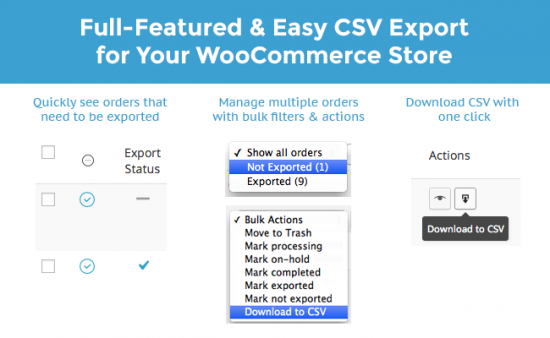 The WooCommerce CSV Export Suite lets you export individual order or customer records, bulk export records on-demand, or you can set up automatic exports via FTP, HTTP POST, or email for orders and customers! Order, customer, and coupon exports are processed asynchronously in the background on your site. 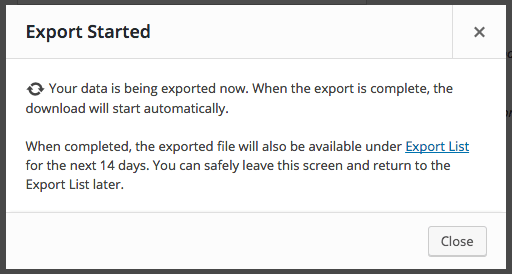 This means that you can begin an export, and it will process as you continue to work on other things. 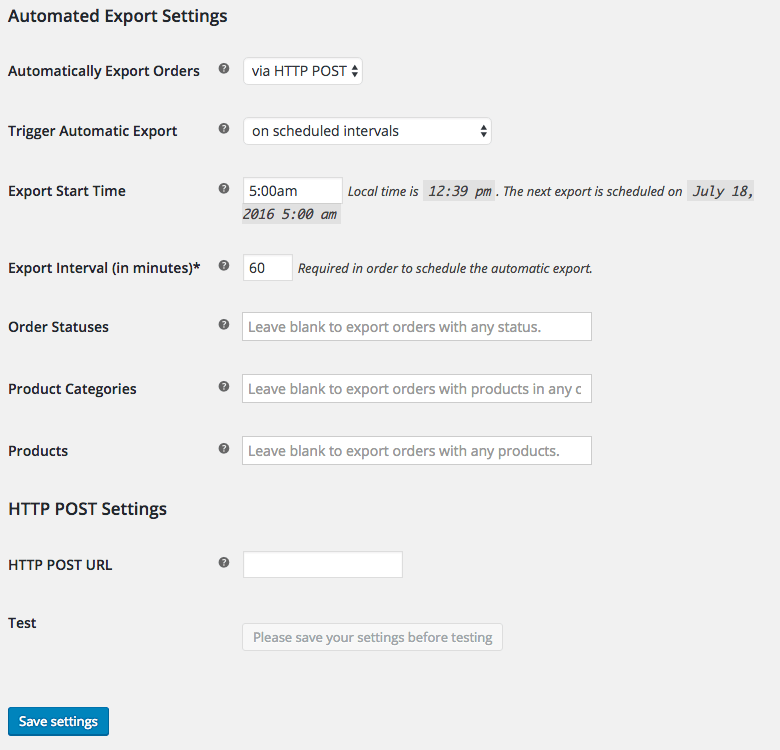 These exports are batch-processed to prevent timeouts, letting an export churn through thousands of records while you continue working on your site. You can even leave your site completely and exports will continue to process, waiting for you to return to download them! You’ll be notified as exports you’ve started have finished. Processes exports asynchronously so thousands of records can be exported at one time, even while you continue working on your site! Need something a bit different? 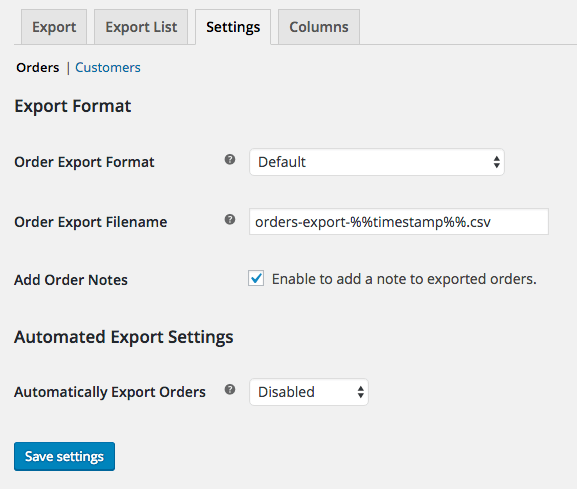 You can create a customized export format, including only the columns and data you need in your exported file. 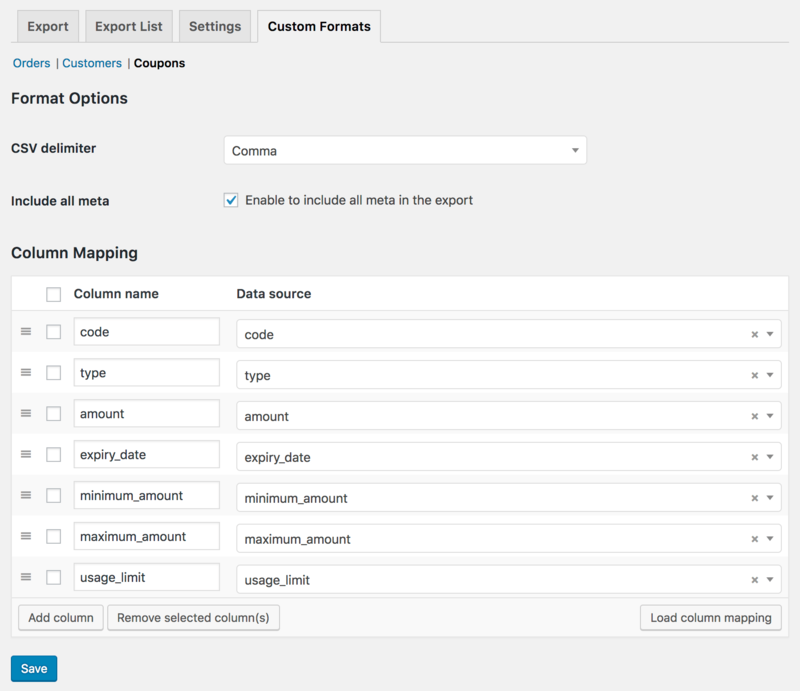 Rename, re-order, and remove columns, or add new data (such as static values) or meta data for your order and customer exports. You can then select your “custom” format as your export format. Need a filtered export? 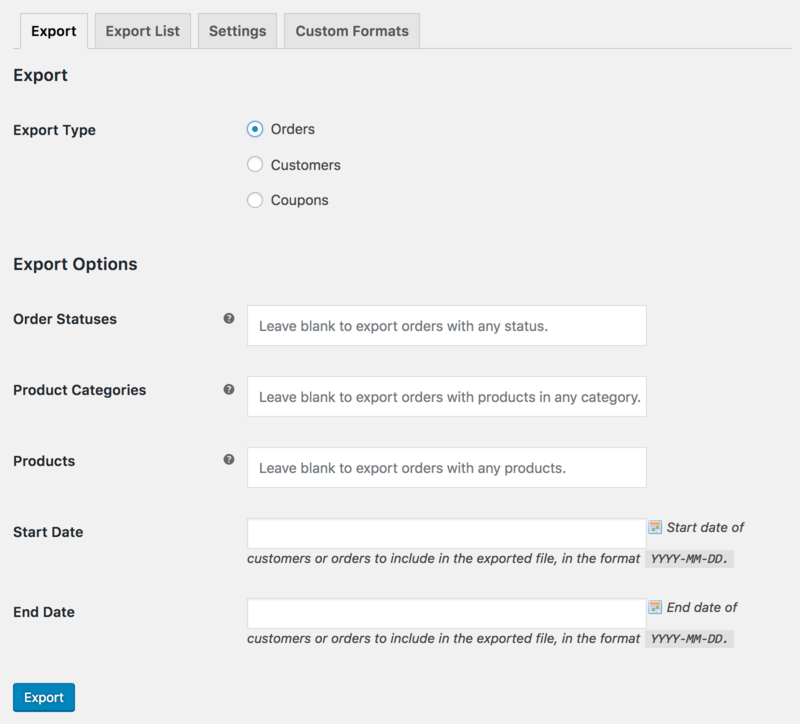 Set which order statuses you’d like to export, export orders containing specific product categories, or only export orders that contain particular products. You can also export orders based on the date they were placed. You can also use the bulk export tool to export customers by date based on their purchase / registration date. Need to export orders on-the-go? 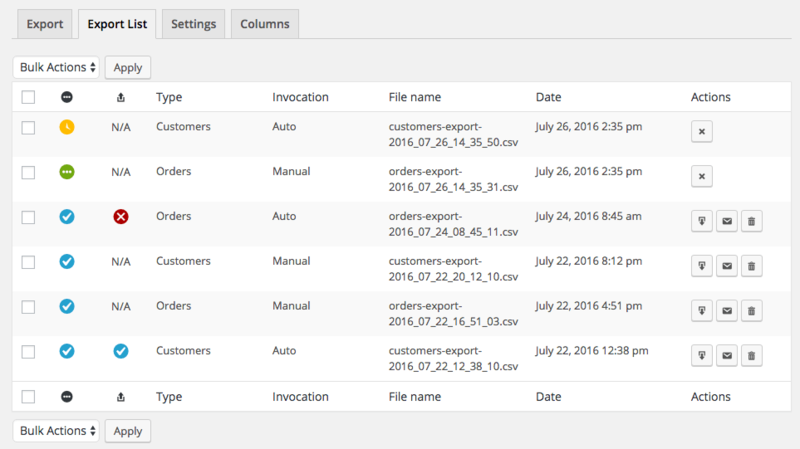 There are single order actions and bulk actions to let you export orders while you view them or view your “Orders” list, and a bulk action to export customers from the “Users” list.